Impossible is Nothing: Twittering, Tweets and Twitterrific! 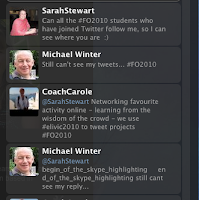 Finally got organised with twitterrific today - hoping it is going to help be become a better tweeter! I have seen the benefits of following like minded people on twitter and know there is a real value in sharing links, ideas and resources via twitter. Wish me luck! What skills or resources do you need to network and facilitate meetings using Twitter? How do you see yourself using Twitter in the future, if at all, for online facilitation? What do you need to do develop an effective online network that you can use for your online facilitation? To begin with, setting up own network, thinking about the "focus" for this - eg for us, education and technology. Working with others existing networks and starting to "follow" some of their people. When networking the need to have something interesting to say/resources to share/ideas and links. In the online relationship we feel we need to be giving "something back" as well as receiving.. contribute and receive. For the online relationship to function well there needs to be effective sharing between "tweeters". Thinking about our "online facilitation" in our context - we probably wouldn't use twitter but if we were looking for resources for online facilitation we could use twitter as a tool to search for resources/ideas. Feel we would "scare" our new people if we started expected them to use twitter. But would always encourage to explore as so all web 2.0 tools for professional networking. What tips can you share about online networking that will help us improve our online facilitation skills? Keeping it current and making regular postings. Great working with you again today. It is good to be able to discuss topics as well as to have a backchannel during our twitter meeting. Look forward to your tweets! How did you find the Twitter meeting? Did you get anything out of it, or did you have difficulties like some of the others. Found twitter meeting great experience wise but probably not so keen on using it as a meeting tool. 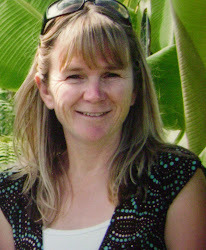 I find twitter fantastic for sharing ideas/resources/links etc with the other teaching/education professionals. Posing questions and getting feedback is also good so I can see it's benefits. It was a shame it wasn't playing the game properly on Friday and not everyone could be involved. 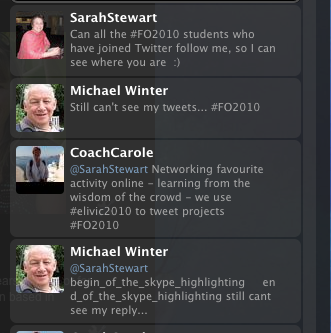 Great to find new twitter contacts though and "virtually" get to know others on FO2010. Thanks for organising.